The World Economic Forum’s Global Risk Report highlights water scarcity as a major risk to manufacturing businesses. Water is a vital component in many manufacturing processes and the demand for it is increasing with population and industry growth. So what would happen to your business if your water system failed? You’ll have a Business Continuity Plan in accordance with ISO 22031, the latest globally recognised standard to help you plan for “business as usual” during unforeseen circumstances. But what does it say about water? Imagine it’s Sunday morning. The water treatment plant has gone down and you’re faced with losing production, which means you’re losing money. You have four hours to get 30m3/h of deionised water to the manufacturing area or to the boilers. Financial constraints mean that there is no standby capacity in the water treatment plant, so when a problem – chemical or mechanical does occur, production is at risk. 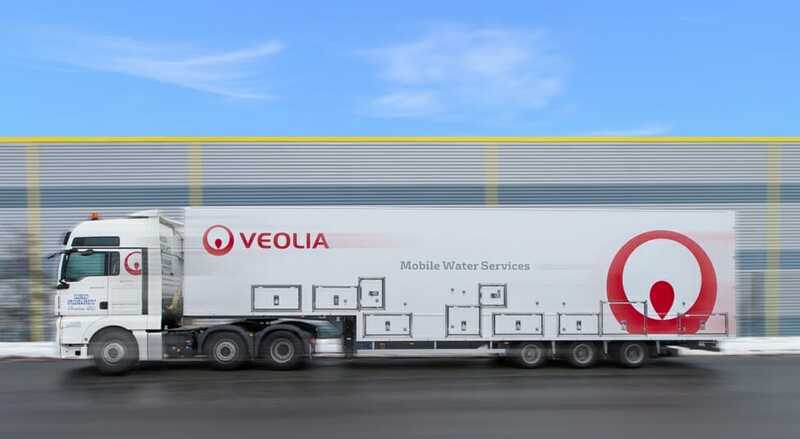 It was to meet emergencies like this that Veolia Water Technologies (Veolia) developed their ReAct ‘Treated Water Security Plan’. ReAct provides the customer with a free assessment of their water treatment requirements, identifies potential risks and prepares a response plan to minimise any disruption to their water supply. Companies who register for this plan receive a full business continuity audit, which in the event of an emergency will speed up the process, ensure peace of mind and avoid costly downtime. The Security Plan may involve the deployment of a Veolia mobile treatment plant, but will probably also include changes to site procedures, increased service cover, stocking of strategic spares, safety reviews and so on. It will also identify the preparatory actions you will need to take to enable the emergency strategy to be implemented. Spare parts can be shipped and mobile plant deployed within hours, but problems can still arise for relatively minor reasons, such as the wrong type of connection, method statement approval or lack of a local power supply. If the ReAct team has full details of the site then the correct equipment or spares can be despatched first time and can be installed using a pre-agreed method statement. The Energy Recovery Facility (ERF) based in East Sussex, UK is typical of Veolia’s ReAct customers. The ERF handles 210,000 tonnes per year of residual municipal solid waste and street cleansing waste from the local council area, which are incinerated to fuel two 50bar water tube boilers to generate steam which drives turbines generating 19MW of electricity, most of which is exported to the grid. The process significantly reduces the volume of waste disposed of to landfill and also allows some of its residue to be recovered or recycled for re-use. “The temporary plant helped us out of a situation that could not be avoided. It enabled us to continue running at full capacity while the control system modifications were being implemented, thus allowing the on-site plant back to normal operation. To discuss your Business Continuity Plan visit this page.